The information contained in the materials that may be accessed above was, to the best of American Express' knowledge, timely and accurate as of the date or dates indicated in such materials. However, the passage of time can render information stale, and you should not rely on the continued accuracy of any such materials. American Express has no responsibility to update any information contained in any such materials. In addition, you should refer to American Express' reports that it files with the Securities and Exchange Commission for information regarding the risks and uncertainties to which forward-looking statements made in such materials are subject. 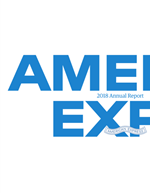 Such risks and uncertainties may cause American Express' actual results to differ materially from those described in the forward-looking statements. This presentation contains certain forward-looking statements that are subject to risks and uncertainties and speak only as of the date on which they are made. Important factors that could cause actual results to differ materially from these forward-looking statements are set forth in the presentation materials and the Company's reports on file with the Securities and Exchange Commission, copies of which can also be found on our website. This presentation contains certain forward-looking statements that are subject to risks and uncertainties and speak only as of the date on which they are made. Important factors that could cause actual results to differ materially from these forward-looking statements are set forth in the Company's reports on file with the Securities and Exchange Commission, copies of which can also be found on our website.